December brings an important event for birders — the annual Christmas Bird Count (CBC)! The Christmas Bird Count is the longest running wildlife census in North America. It was started over 100 years ago by the National Audubon Society in the United States, and in Canada is co-ordinated by Bird Studies Canada. The information collected by thousands of volunteers makes up one of the world’s largest sets of wildlife survey data, and provides scientists with important information on populations and distribution of wintering birds. 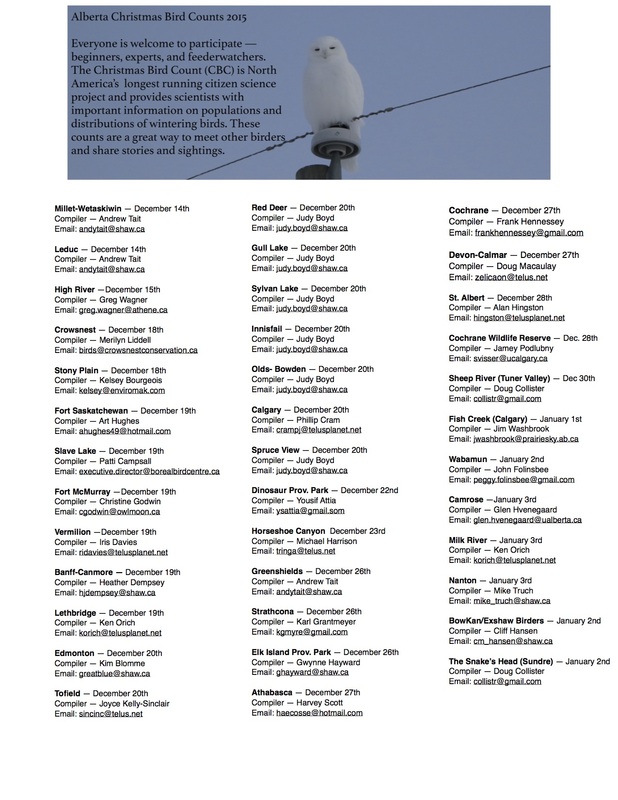 Christmas Bird Counts are conducted on a single day for each community between December 14th and January 5th. Counts are carried out within a 24 km (15 mile) diameter circle that stays the same from year to year. Birders count every bird they see or hear, and all the data are compiled at the end of the day, sometimes at a get-together or potluck. There are two different types of counters: field observers and feederwatchers. Field observers cover a portion of the count circle individually or with a small group. Feederwatchers count the birds at their feeders, often in the comfort of a warm house, which makes it the perfect activity for young children, seniors, and those in colder climates. New and beginning birders are always welcome and encouraged to participate. Most organizers place an experienced birder on each team, so don’t be concerned if you’re still learning the ropes of birding. I’ve been participating in my area’s count for six seasons, and this year I’m organizing our count in Vermilion. There are lots of counts taking place all over Alberta, and while the Nature Alberta website has a list of some of the counts, I thought I’d make a more comprehensive “At a Glance” list. You can find a PDF version here. If you see that your community isn’t included, please let me know in the comments below. To find all the counts happening across Canada, go to the Bird Studies Canada’s map here. To find all the counts happening across the United States and Canada, go to the National Audubon Society’s map here. This entry was posted in Alberta Birds, Birding, Birding Events, Canada Birds, General Birding, Holidays, Nature, Wildlife, Winter and tagged Bird Studies Canada, CBC, Christmas Bird Count, Christmas Bird Counts, December Birding, National Audubon Society, Nature Alberta. Bookmark the permalink. That’s Terrific Yvonne! Contact Mike Burrell, Bird Studies Canada’s Christmas Bird Count Coordinator: cbc@birdscanada.org. at andytait@shaw.ca or the Vermilion CBC on December 19th, you can contact Iris Davies (ridavies@telusplanet.net) or me at cnafarm@gmail.com to participate.